How did your interest in Indian music start and who were your first gurus? Professor Fumio Koizumi, an ethnomusicologist is the first person to introduce Indian Music to Japan. He studied at Central College of Carnatic Music at the time when Bombay sisters were students there. When I was a university student, I had the opportunity to learn from him. In 1970s Ravi Shankarji visited Japan and listening to him also kindled my interest in Indian music. Prof. Koizumi suggested that I should go to South India because Carnatic music has old tradition and it is pure Indian music. I took his advice and joined CCKM as a visiting student in 1972. At that time Ms. Kalpakam Swaminathan and Ms. Rajalakshmi Narayanan were the Veena teachers there. Hence they are my first gurus. Veena is an original Indian instrument and its sound is attractive and beautiful. Did you continue to learn from them or did you learn from others also? College classes were group lessons. At that time I could not follow the classes very well. Hence I started learning from Sri Mokkapati Nageswara Rao privately, who was Prof. Koizumi's colleague at Wesleyan Univ. in USA. After Nageswara Rao passed away, I learnt from his daughter Mokkapati Sarada. I arranged for their concerts in Japan two times. Meanwhile, I started Rhythm training lessons from Sri Govindarajan, son of Rajalakshmi Teacher. And again I learnt Veena from Rajalakshmi teacher. This time I could follow the lessons. After Rajalakshmi teacher passed away, I learnt from her daughter Smt. N. Vijayalakshmi (continuing still) and Kalpakam teacher again. How many years of training did you undergo? For about a year in 1972 and for about three months in 1975. After that I could not visit India for 10 years because I got two daughters. When my younger daughter was 8 years old, I came back to India with her. After that I started learning again every year. But my visit was only 6 weeks or so, during my college summer holiday. So, I learnt little by little for about 40 years!! What about communication? Did you learn English in school? education is 9 years in Japan. (Elementary 6 years and Junior High School 3years) English is taught from Junior High School. After High School (3years) University (4years) is optional. Do you find any similarity between Japanese music and carnatic music? As an Asian music, there are some similarities, eg. subtle melody line like gamaka. But Carnatic music is more logical and systematic. Do you play/sing Japanese music? I learnt Japanese traditional Noh Singing and drum and Koto (string instrument) at University but now I forgot everything. I graduated from Department of Musicology. So I am a musicologist and I was a lecturer. But I want to be a musician, a Veena player. Gardening and, walking are my two hobbies. Your future plans? And how often do you come to India now? I want to improve my veena performing. So, I practise regularly, and visit Chennai and continue to learn. I hope to come to India every summer and winter (2 times a year). 4 years ago, I retired earlier from my college because I want to concentrate on Indian music only. Are you teaching in Japan and how many students are there? I am teaching Carnatic music in Japan. I have 3 regular students and 4 temporary students now. Have you given any concerts in India and also in Japan? I had some concerts in Chennai. I gave a veena recital at Dept. Of Music, Madras University in the year 2000. After that in 2007 and 2009, I gave Veena duet concerts along with my Guru Smt. Vijayalakshmi. In January 2013 I gave a solo concert. In Japan, I have many opportunities to play Veena and introduce Carnatic music to my country. Last year I gave a Veena Concert of Swati Tirunal compositions in Tokyo, and a performance at Namasthe India in Tokyo. 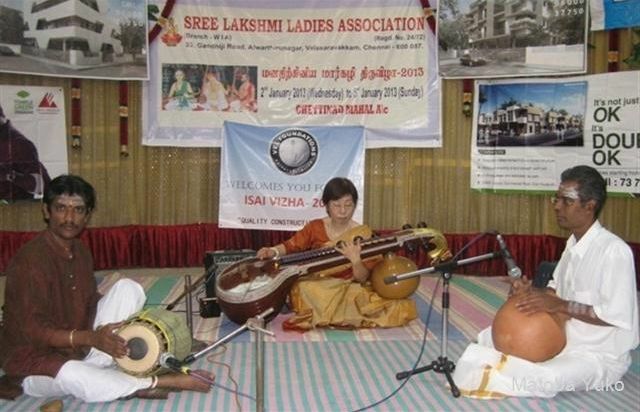 On 24-02-2013 I gave a Veena performance at Matsue City by Eastern Accademy. I will also be playing at Indian Embassy in Tokyo and at Indian association in Japan in April and May this year. Are there any other Carnatic musicians in Japan? There a few vocalists, and also mridangam, ghatam, kanjira and Morsing artistes! !